By default, I am now getting calendar event notifications from newly created events 10 minutes before the start time. I'd like to change this to be 5 minutes before the start time by default because otherwise I will start working on something else in that 10-minute span and forget about the meeting. There used to be a global setting for this in the old Google Calendar. 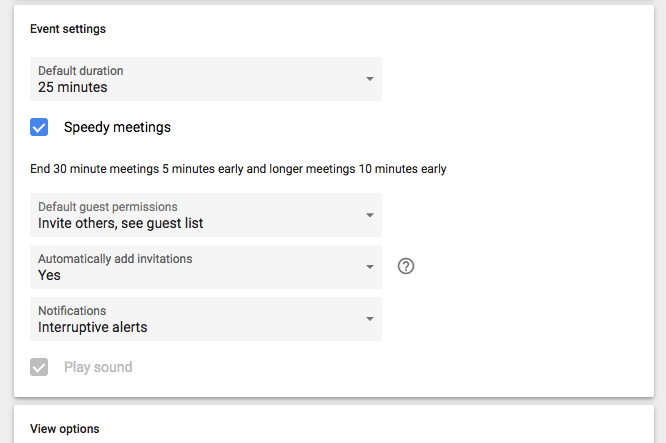 In the "new Google Calendar", I cannot find the setting. Does it still exist? Here's what I see under settings > event settings. It appears to be a per calendar setting now. Unfortunately, it doesn't appear to be something you can change globally. A bit of a bummer for people like us who have a lot of custom and shared calendars. Not the answer you're looking for? Browse other questions tagged google-calendar google-calendar-reminders or ask your own question. All-day-event notification: how to get notified during event, on the same day? Multiple default Popup notification for ALL events?